I like to make my daughter a special t-shirt for every holiday. I have to fit them all in now, because she is almost "Over it." 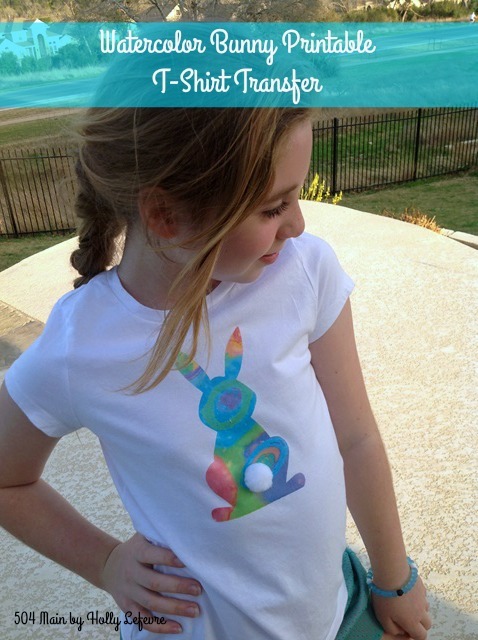 Last year, I made a painted striped bunny T-Shirt, and if I do say so myself thought it was pretty dang cute! This year, I wanted to do it again, but thought how can I make it different and even simpler for you to make one yourself. 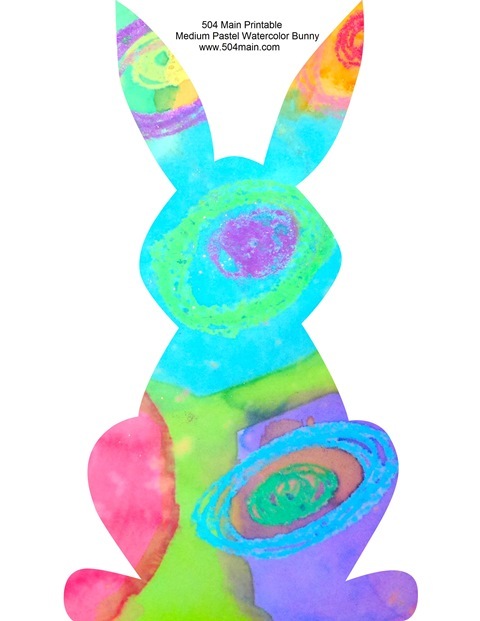 So, I pulled out some old watercolor originals of mine added it to my bunny template from my bunny banner and voila...its almost done for you! 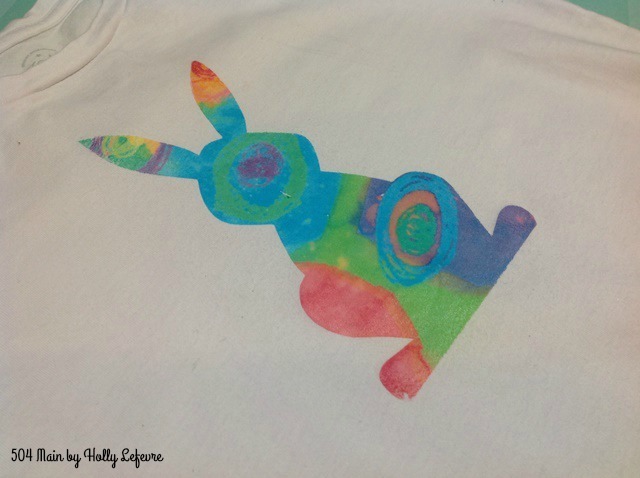 I literally made this entire T-shirt in less than 30 minutes...and honestly you can probably even do it in less time! So, let's get to it! Plain T-shirt. I prefer White for this project so that the colors look as they are supposed to. Most craft or mass merchandise stores carry really inexpensive t-shirts. Iron, ironing board and a cloth to use for pressing. 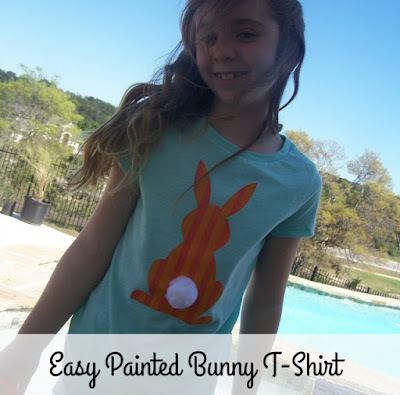 Wash your shirt; print out the bunny; cut it out; press it on; attach a pom pom tail. 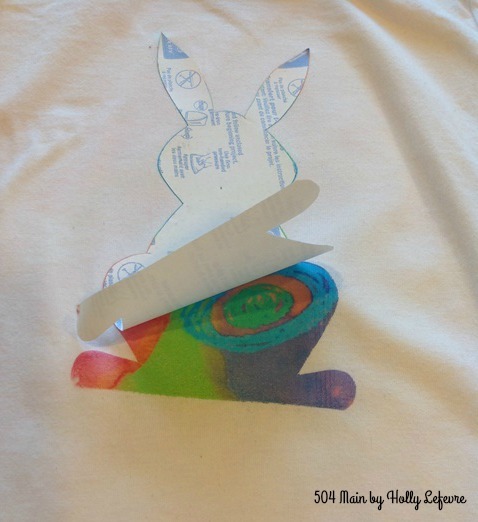 Prepare your bunny for printing. Load the Transfer paper in the printer. 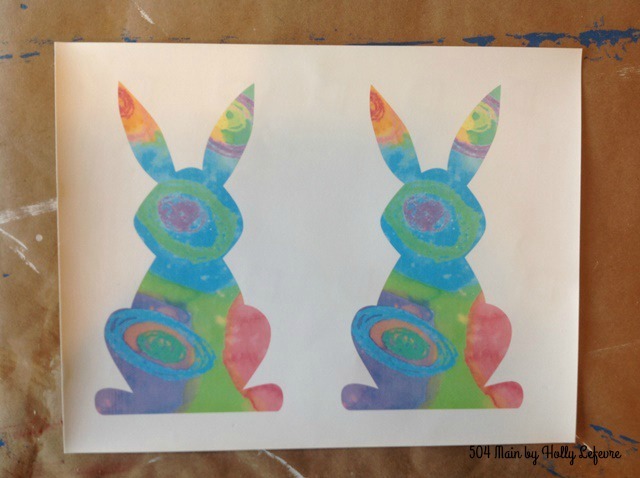 In printer options, select Mirror (if you want the bunny to print out exactly as you see it. If not the image will be flipped when you iron it on.). 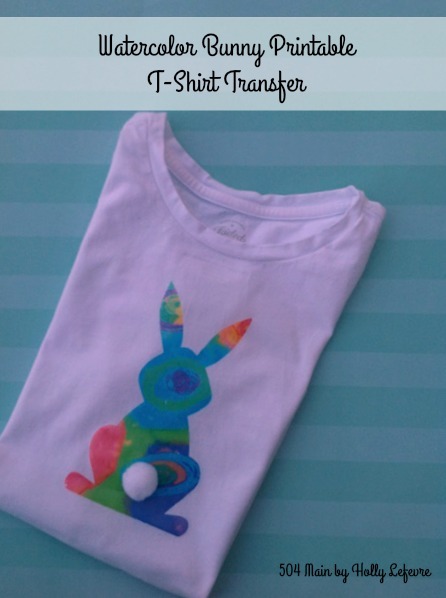 Print the bunny out on T-shirt transfer paper. 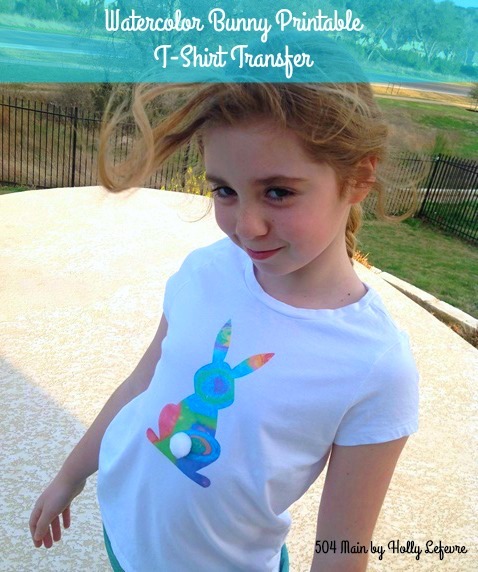 Follow the directions for your printer and for the brand of transfer paper your purchase. 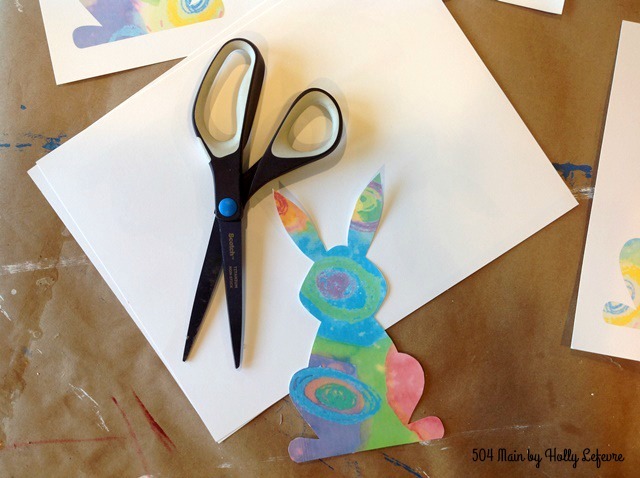 Cut the bunny out with scissors. Preheat your iron to specified settings on your paper. Pin into place in a corner or be VERY careful and place the pressing cloth. 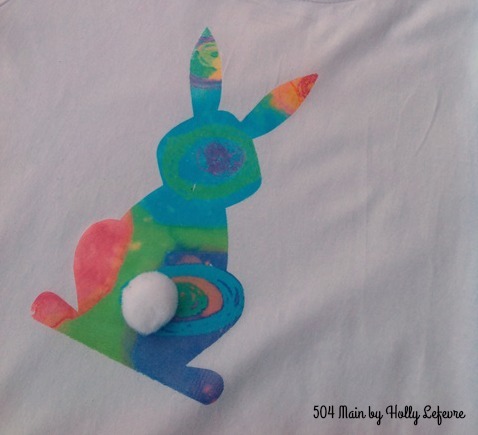 Press the bunny onto the shirt. I move my iron all over and hold down in each area for 20 seconds or so. Remove the pressing cloth and let cool, for just a minute. From one corner, start peeling the backing off. If you are having trouble with it sticking or do not see the image on the shirt, replace the pressing cloth and press the design some more. 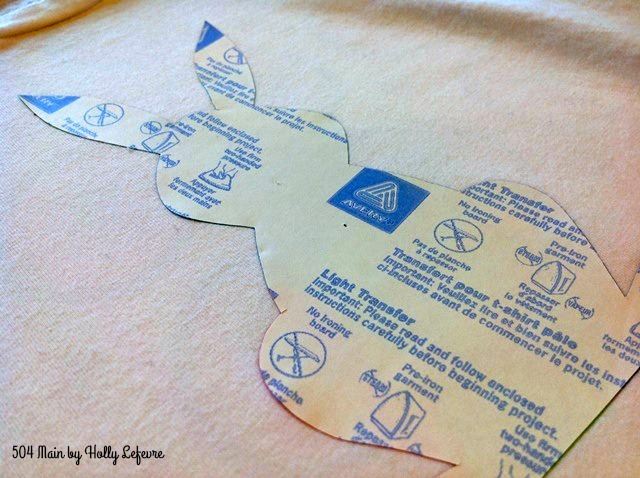 Remove backing...and you have a fun bunny! Add a white pompom for a bunny tail. I like to use needle and thread if I suspect this is going to get washed, but you can try hot glue or fabric glue. 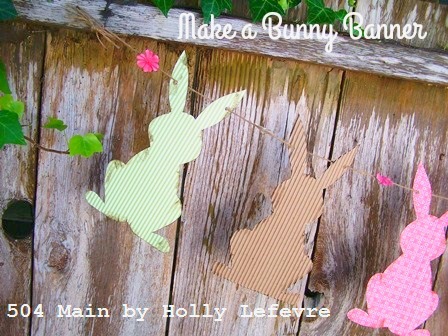 or a super simple Easter Bunny Banner! What an adorable shirt and I have to agree your daughter is a beautiful model! Your tutorial is really good. 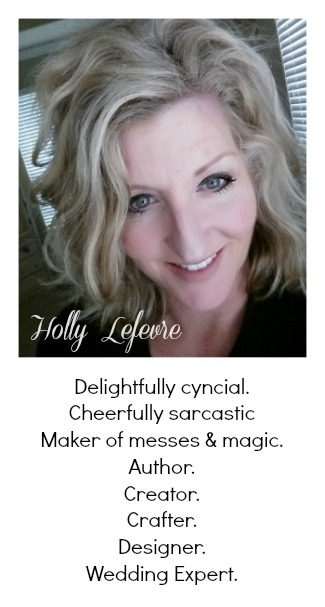 Thanks for sharing and for sharing the template too! Such a cute shirt! I love the pattern of the transfer - so colorful and your model is gorgeous. I remember when I started following you she was just a little peanut.